Marciano's 49-0, Mayweather's 50-0, Foreman's record as oldest heavyweight champ – Wilder says he can break 'em all! Marciano’s 49-0, Mayweather’s 50-0, Foreman’s record as oldest heavyweight champ – Wilder says he can break ’em all! 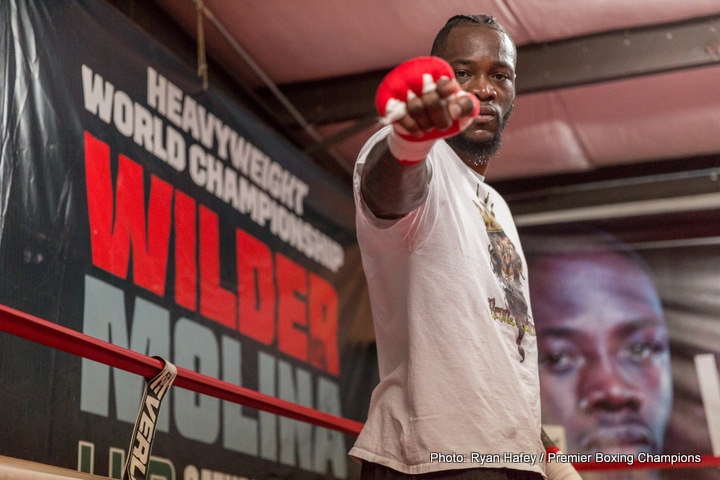 WBC heavyweight king Deontay Wilder is in a mood to not only break opponents, and their bones, but also world records. Wilder, currently unbeaten with impressive 39-0 numbers (all but one of his wins coming via stoppage) says he can “easily” top Floyd Mayweather’s astonishing 50-0 pro record; Floyd actually besting heavyweight immortal Rocky Marciano’s magic 49-0 number this year (some say with an asterisk firmly placed alongside the 50-0 due to the fact that Mayweather picked up his “final” win against a boxing novice). Wilder may or may have enough time on his side to be able, possibly, just maybe, to break 49-0, even 50-0, but he’s still a way off. Presuming Wilder beats Luis Ortiz on March 3rd (fight still not finalised, but Wilder says it will “definitely happen”), to go to 40-0, he would then need ten more fights to break Rocky’s record. With Wilder taking three fights a year (he boxed just two last year, and two bouts a year seems to be a common theme for big-name fighters these days), it would still take him into the year 2021 to hit 50-0. Again, maybe he can do it, maybe not. The closest any heavyweight got to tying Marciano’s record was Larry Holmes who in 1985 was 48-0, before losing to Michael Spinks. Holmes was 35 years old when he suffered a loss for the first time. Can Wilder stay unbeaten until the age of 35 and beyond? Let’s see how Wilder copes in his “toughest fight yet” against Ortiz before we get too excited. Next boxing news: Deontay Wilder vs Anthony Joshua: A modern day Foreman-Lyle!? You are here: Home / Boxing News / Marciano’s 49-0, Mayweather’s 50-0, Foreman’s record as oldest heavyweight champ – Wilder says he can break ’em all!